According to report, Huawei (Chinese Smartphone Manufacturer) has released their P30 and P30 Pro mid-range Smartphone last month. Both the phones have Android 9.0 Pie and EMUI 9.1 OS support while P30 Lite cones with Android 9.0 and EMUI 9.0. When we talk about processor, Huawei P30 and P30 Pro come with HiSilicon Kirin 980 processor with 7nm process and HiSilicon Kirin 710 with 12nm process respectively. However, these devices are barely one month old. But users are complaining about the issue with huawei P30 models. Let’s take have a look at Huawei P30 fingerprint sensor icon blinking issue. For those who are not aware, Huawei Company has released its P30 Smartphone which has great features like in-display fingerprint sensor. But, we have also researched that P30 users are facing problem with fingerprint sensor icon and reporting across different social media platforms. When we talk about issue, users have noticed that their device’s fingerprint icon keeps blinking randomly even when the Smartphone’s kept idle. It means that there is no specific pattern as the fingerprint sensor icon blinks intermittently. Got my Huawei P30 3 days ago and noticed one suspicious behavior on the idle phone, even when I’m quite far, and there are no moving objects near the phone – it would display the fingerprint icon on the black, idle screen. I bought a Huawei P30 3 days ago and noticed one suspicious behavior, even though I was quite far away from the phone (np. 1.5m) – on a black screen it would itself display a fingerprint reader icon in the display (randomly every 30-60 seconds). We’re definitely not the only ones, I see the issue popping up here and there in some forums. P30 pro is definitely no affected, only some P30 which would indicate some HW differences. I tested every sensor on the phone and they all work as intended. Huawei’s employee has acknowledged the issue at the company’s official UK forums. 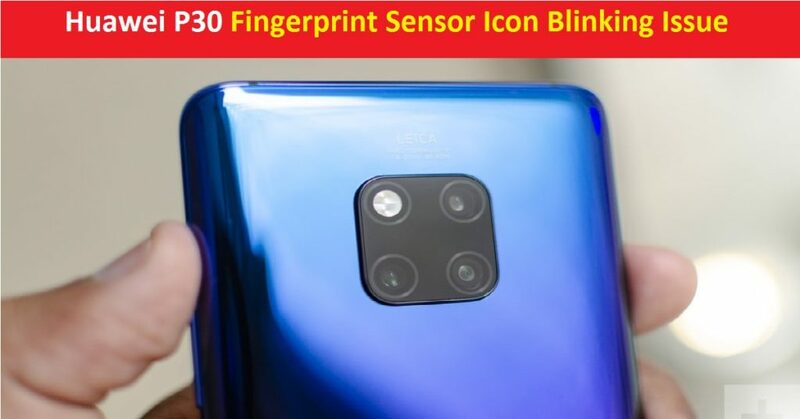 The company has confirmed that fingerprint sensor icon blinking issue with P30 phones is known by them and they are working toward resolving. It is expected that with the May update, this issue will be fixed. Let’s take have a look at Huawei Company’s statements on this matter. We are working on this issue and expect to release a new version in May. Please wait patiently for the system version update. We hope Huawei P30 fingerprint sensor icon blinking issue will be fixed with new update i.e., May update next month. At the moment, we all have to wait for it. Anyway, we are researching on the matter very deeply and we will defiantly post an update, if it will come in future. For any suggestions or queries, please write on comment box given below.